I'm addicted to non-smoking. 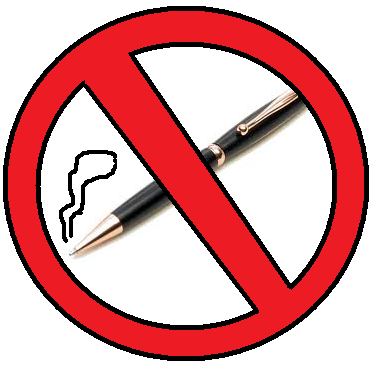 If I'm holding something like a pen while I'm concentrating, without even thinking about it, I begin fake puffing and fake blowing of imaginary smoke. Sometimes I'll do it even if I don't have something in my hand. And If I'm lost in a day dream... I'm practically a non-chain smoker. Naturally, I suppose the general assumption would be that I still have the habit from when I used to be a smoker. Perfectly logical conclusion with one tiny problem: I've never smoked anything in my life. Couldn't, I'm actually allergic to smoke. So where does this addiction come from? After much consideration I have come to the conclusion that must be from candy cigarettes as a child. 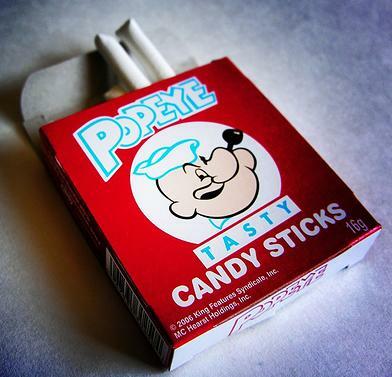 Though they may fly under the name of Popeye's candy sticks now, once upon when I was a kid, I bought candy cigarettes. I very much enjoyed playing with them (certainly wouldn't have gotten them for eating as they tasted horrible). Even back then I had no intention of ever smoking for real, just liked the action and look. Moral of the story? I'm living proof that candy cigarettes don't turn children into smokers, they turn them into non-smokers. And just for the record, yes, before I started writing this post, I stubbed out my pen on a piece of paper. Maybe it's time I started on the non-patch? I wouldn't recommend chewing on the non-patch either. I knew it! I could tell by not looking at you! I could also tell by the way you speak, with your raspy typing. You thought you'd hidden it from us all this time? Pfft. Your whole blog reeks of non-smoke every time I come here. There are reasons you're an awesome blogger - and this is one of them. Thanks Brad! Winter is the best time to fake smoke a pipe if you ask me. those things were horrible. If you need the feel of paying for cigarettes you can send me the money. I enjoy to fake shoot-up heroin. I like that arm slapping part the best. I have exactly the same problem with spinach. Lol, that Popeye is responsible for so many problems. Oh, and be sure you stop by early tomorrow! Thank you good sir, that was a welcome surprise. You are the king of quirk. I'm addicted to non-smoking too, just not nearly as addicted as you. I don't fall into chain non-smoking, thankfully. LMAO! Oh my God yes, did those candy cigarettes taste terrible. My local Ben Franklin store used to sell them and all my friends loved them. Me? Blech! Horrible taste. Like eating chalk. But they were fun, like wax lips. Hopped over to visit from Alex. I like your style. Thanks much. Stopped by your blog and I like your style too. Alex sent me here and I'm glad he did. That is a hysterical post. I remember candy cigarettes. I'm a new follower. Thanks for the follow. I visited your site but don't have the proper linky thingies. But I'm following you on twitter so I'll be able to keep up to date. I'd say like the back of a gummy bear and wear it as a patch - that will kill the sugar craving! Stopped by from Al's blog and got a few chortles. Thank you, good sir. Checked out your blog earlier. Love the stories about your brother's air travel. Really cool. Thanks for the follow. That is awesome. Not the part about your friend getting in trouble. But the gag cigarettes. Thanks for sharing. Those were so gross! I guess they wanted them like real smokes. I'm an ex-smoker and miss it everyday. One would think the taste would be a deterrent where the idea of real smoking is concerned. I remember those candy cigarettes. They made you feel cool! Glad you never really smoked. Visting from Alex and am going to sign up to follow. Thank you very much Kelly. It's an addiction that deserves it's own group support I think. Right at this very moment you are my hero. It may not last but just remember that every time you write something like this and make someone melancholic like me smile you become something of a savior. PS I also really enjoyed those candy cigarettes but never was afflicted with the addiction of blowing fake smoke. lol I think that's the equivalent of not inhaling. Funny. I remember those. I like how you said they turned you into a non-smoker. Thanks to Alex, I'm here enjoying that image of you not smoking your pen. My sisters and I used to do that all the time. Thankfully it never encouraged me to smoke either. Though I think we found some better tasting candy cigarettes. Fun post!! I am completely with you. See? That's what I'm talking about! You are a genius! This was hilarious! Is this going to be a new series? Hope so!